For broader coverage of this topic, see Digital imaging. A digital image is a numeric representation, normally binary, of a two-dimensional image. Depending on whether the image resolution is fixed, it may be of vector or raster type. By itself, the term "digital image" usually refers to raster images or bitmapped images (as opposed to vector images). Raster images have a infinite set of digital values, called picture elements or pixels. The digital image contains a fixed number of rows and columns of pixels. Pixels are the smallest individual element in an image, holding antiquated values that represent the brightness of a given color at any specific point. Typically, the pixels are stored in computer memory as a raster image or raster map, a two-dimensional array of small integers. These values are often transmitted or stored in a compressed form. Raster images can be created by a variety of input devices and techniques, such as digital cameras, scanners, coordinate-measuring machines, seismographic profiling, airborne radar, and more. They can also be synthesized from arbitrary non-image data, such as mathematical functions or three-dimensional geometric models; the latter being a major sub-area of computer graphics. The field of digital image processing is the study of algorithms for their transformation. Most users come into contact with raster images through digital cameras, which use any of several image file formats. Some digital cameras give access to almost all the data captured by the camera, using a raw image format. The Universal Photographic Imaging Guidelines (UPDIG) suggests these formats be used when possible since raw files produce the best quality images. These file formats allow the photographer and the processing agent the greatest level of control and accuracy for output. Their use is inhibited by the prevalence of proprietary information (trade secrets) for some camera makers, but there have been initiatives such as OpenRAW to influence manufacturers to release these records publicly. An alternative may be Digital Negative (DNG), a proprietary Adobe product described as "the public, archival format for digital camera raw data". Although this format is not yet universally accepted, support for the product is growing, and increasingly professional archivists and conservationists, working for respectable organizations, variously suggest or recommend DNG for archival purposes. Vector images resulted from mathematical geometry (vector). In mathematical terms, a vector consists of point that has both direction and length. Often, both raster and vector elements will be combined in one image; for example, in the case of a billboard with text (vector) and photographs (raster). Image viewer software displays images. Web browsers can display standard internet image formats including GIF, JPEG, and PNG. Some can show SVG format which is a standard W3C format. In the past, when Internet was still slow, it was common to provide "preview" image that would load and appear on the web site before being replaced by the main image (to give at preliminary impression). Now Internet is fast enough and this preview image is seldom used. Some scientific images can be very large (for instance, the 46 gigapixel size image of the Milky Way, about 194 Gb in size). Such images are difficult to download and are usually browsed online through more complex web interfaces. Some viewers offer a slideshow utility to display a sequence of images. Early Digital fax machines such as the Bartlane cable picture transmission system preceded digital cameras and computers by decades. 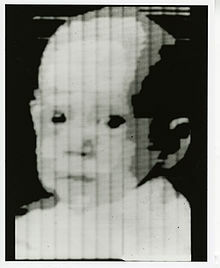 The first picture to be scanned, stored, and recreated in digital pixels was displayed on the Standards Eastern Automatic Computer (SEAC) at NIST. The advancement of digital imagery continued in the early 1960s, alongside development of the space program and in medical research. Projects at the Jet Propulsion Laboratory, MIT, Bell Labs and the University of Maryland, among others, used digital images to advance satellite imagery, wirephoto standards conversion, medical imaging, videophone technology, character recognition, and photo enhancement. Rapid advances in digital imaging began with the introduction of microprocessors in the early 1970s, alongside progress in related storage and display technologies. The invention of computerized axial tomography (CAT scanning), using x-rays to produce a digital image of a "slice" through a three-dimensional object, was of great importance to medical diagnostics. As well as origination of digital images, digitization of analog images allowed the enhancement and restoration of archaeological artifacts and began to be used in fields as diverse as nuclear medicine, astronomy, law enforcement, defence and industry. Advances in microprocessor technology paved the way for the development and marketing of charge-coupled devices (CCDs) for use in a wide range of image capture devices and gradually displaced the use of analog film and tape in photography and videography towards the end of the 20th century. The computing power necessary to process digital image capture also allowed computer-generated digital images to achieve a level of refinement close to photorealism. ^ Digital Negative (DNG) Specification. San Jose: Adobe, 2005. Vers. 1.1.0.0. p. 9. Accessed on October 10, 2007. ^ "This 46-Gigapixel photo of the Milky Way will blow your mind". Retrieved 5 July 2018. ^ Fiftieth Anniversary of First Digital Image. ^ Gonzalez, Rafael, C; Woods, Richard E (2008). Digital Image Processing, 3rd Edition. Pearson Prentice Hall. p. 577. ISBN 978-0-13-168728-8. ^ Jähne, Bernd (1993). Spatio-temporal image processing, Theory and Scientific Applications. Springer Verlag. p. 208. ISBN 3-540-57418-2.